Congratulations to Big Pete, OU’s August 2016 Featured Alumni! It all started back in 1979 in Santa Cruz when Big Pete was finishing high school, making his first treats and growing his first cannabis plants from a seedy stash he was able to sprout. Soon after graduating Big Pete moved to the Big Island of Hawaii where he continued to develop his cultivation and baking techniques. After graduating UH Hilo in 1985 he moved back to the mainland, got married and started a family. As a family man, little league baseball coach and professional landscaper Big Pete still found time to research his old friend Maryjane. After 30 years of research and development, Big Pete joined the medical Marijuana movement in the summer of 2009 by enrolling at University of Oaksterdam. During a special 13 week course Big Pete was inspired to start a business that would make use of all the shake that was going unused from his cultivation projects. The Oaksterdam course covered all the hot cannabis topics at the time from history and politics, cultivation and cloning, as well as butter making. A presentation by a chocolate maker really got Big Pete thinking seriously about a homework assignment that would change his life forever. The assignment was to come up with a plan for a cannabis business. His presentation on a cannabis cookie business went over well and Big Pete kept the ball rolling continuing to build his business plan. Meanwhile, enjoying his final weeks talking shop, learning, and making valuable connections on the Oaksterdam campus. 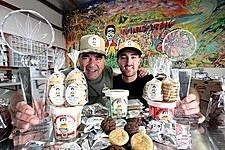 Big Pete with son, Pete Jr. and trophies from HempCon – Best Edible Dessert and Edibles Connoisseurs Choice. Product line shown here in original packaging. By the winter of 2010 Big Pete had perfected his Canna-Butter infusion skills and with help from a few friends got the first batch of “Biggies” out to a local dispensary January 25th 2010. The “Biggies” were made using 40mgs THC from Sativa infused butter. Orders started to really pick up, so he left the confines of his small home kitchen and rented a large commercial kitchen. He started out with 3 Biggie flavors: Chocolate Chip, Peanut Butter and Snickerdoodle which he came up with by chatting with friends and relatives about their favorites. These are still the top sellers! Later that year Big Pete’s son, Pete Jr. graduated from Middle America Christian University and it was with great enthusiasm that Big Pete included 22-year-old Pete Jr. for what would become an epic partnership. Pete Jr. hit the road with his pops on sales trips and quickly learned the ropes. Together they developed new recipes and different dosing options. It was important to the father-son team to make medicating an easy and enjoyable experience for patients, so the Mini Cookie was born. The new smaller cookie allowed them to hand out memorable samples while attending HempCon and Hightimes events which really began to grow the business. They also began an annual series of local beach clean-ups and donating to the Santa Cruz Veterans Alliance. Big Pete’s Double Chocolate Cookie Mini Cookie made with 20 MGs THC from Indica Butter, Coco powder, Oreo crumbles, and chocolate chips! Now they carry a variety of 12 flavors including a Gluten-Free Chocolate Chip Cookie! Nine flavors are available as Mini Singles and in Mini Packs of 6 (our most popular) made with 20 mgs THC from Indica butter per Mini Cookie. They also make 80 mg Indica Cookies and 40 mg Sativa Cookies in 6 flavors including a Sugar-Free option! One of their favorite ways to experience a Big Pete’s cookie is fresh from the oven, so they created the Take-N-Bake tub of pre-rolled, frozen Cookie Dough! With frozen Cookie Dough they are able to hold Cookie Sampling Events in-store with a small oven allowing Big Pete to meet the patients he has had in mind throughout the whole process. Patients are even able to add their experience to the testimonials page on the BigPetesTreats.com website! Big Pete’s Sugar Cookie always made with green sugar! They are in the process of re-branding from their original “Big Pete’s Treats” to a more adult targeted “Big Pete’s -Cookies That Treat You Right” campaign. The feedback from the dispensaries carrying the new packaging has been really positive. 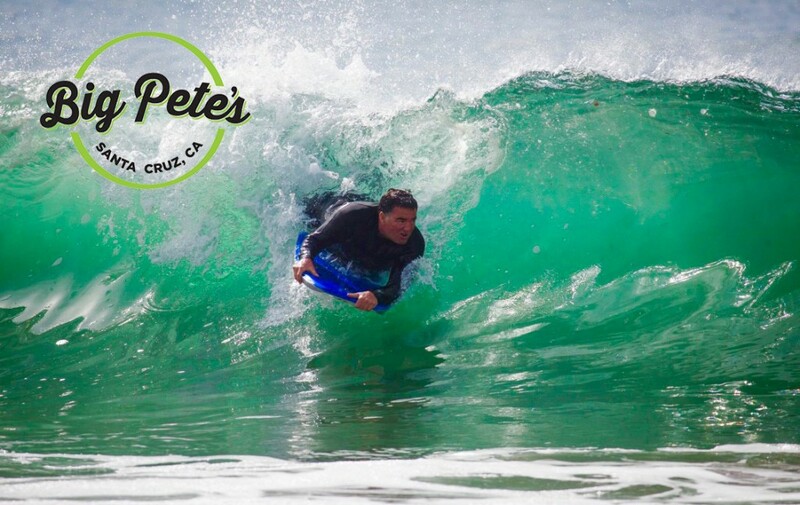 They are also right in the middle of their 2nd annual series of Beach Clean-Ups which is nostalgic for Big Pete, as this success comes full circle from when a high school summer job picking up trash on Main Beach fed his passion for keeping the shoreline clean. For the past 6 years we have established ourselves as one of the leading providers of edible Medical Cannabis in California. We have entered contests, won awards and have had our products on the shelves of over 100 dispensaries in California. Most importantly we have received countless positive testimonials from patients. Having experienced substantial growth in the Medical Marijuana movement in California, we envision Big Pete’s Treats growing into all the Medical Marijuana markets nationwide.